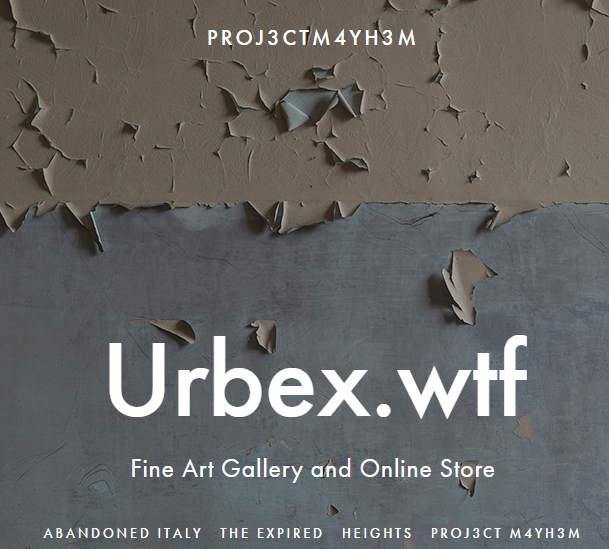 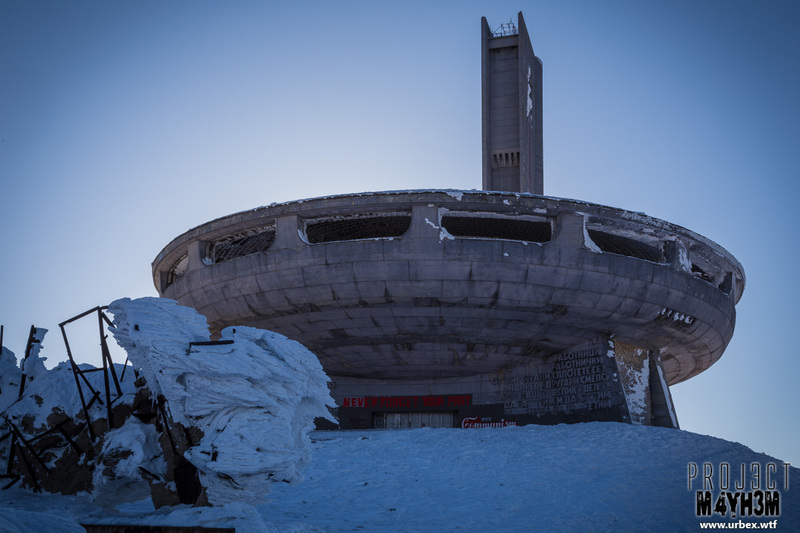 Finally got around to visit this epic location with some of my favourite explorers Andy de Kay of Behind Closed Doors, Travis Andrews of If Walls Could Talk, Val Leroy of Vals Dark Rooms, Baron Scotland of the Baron of Scotland, Matt Hampshire of Kriegaffe 9 and last but certainly not least Mr Oldskool everyone’s favourite Alien. 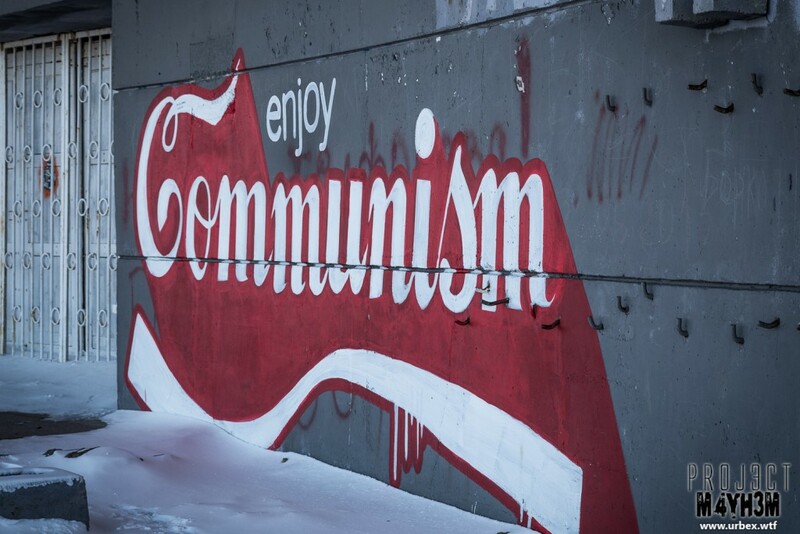 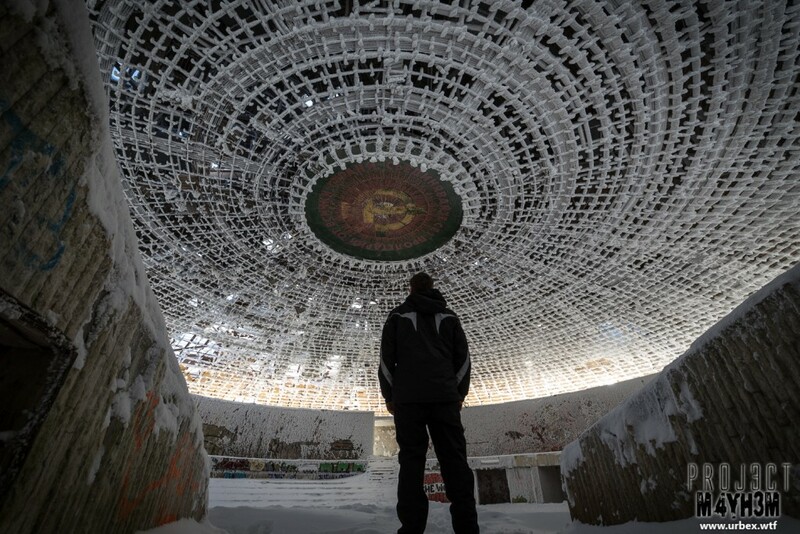 The House of the Bulgarian Communist Party also known as the Buzludzha Monument is one of those places that stands out as being something a bit special and was always a big location on the to-do list, but being so far away in Bulgaria it was just put off time and time again until finally we arranged a SOCC trip :). 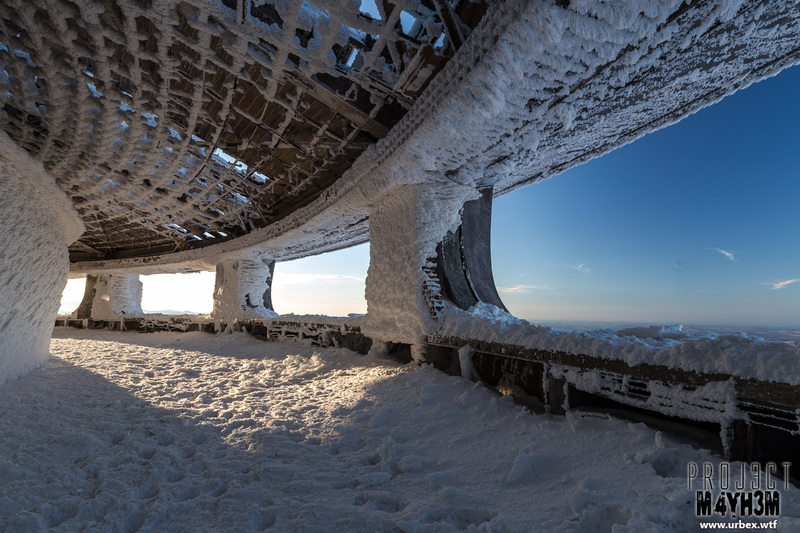 I’d seen hundreds of photos of this place from all seasons but I was really keeping my fingers crossed that we’d have some snow! 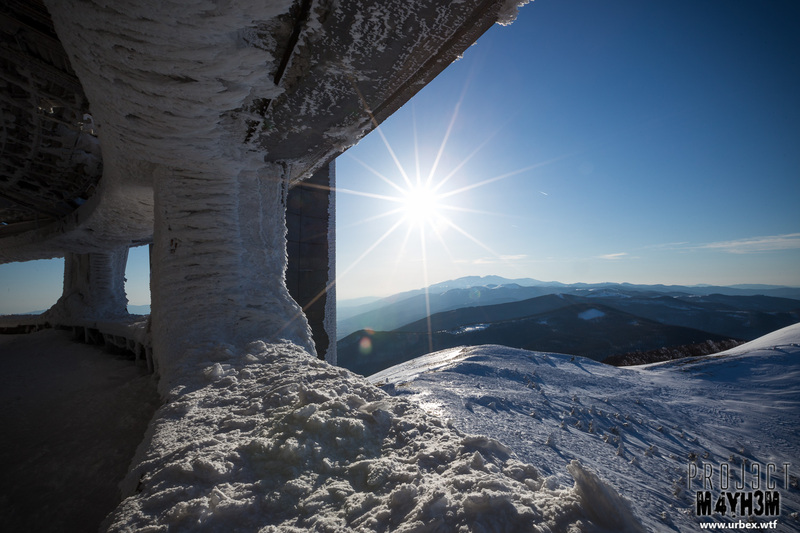 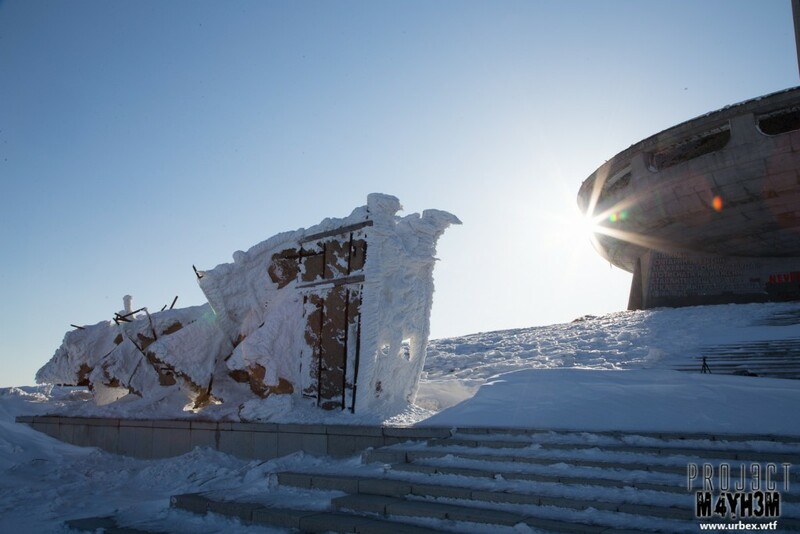 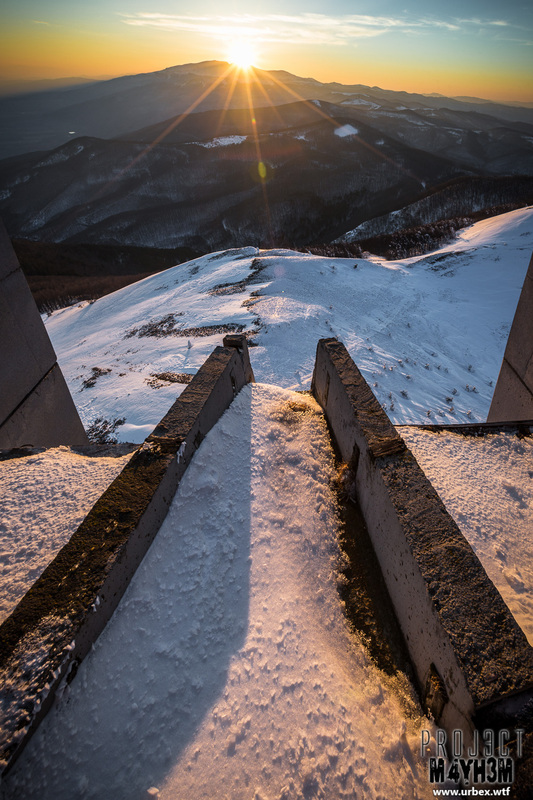 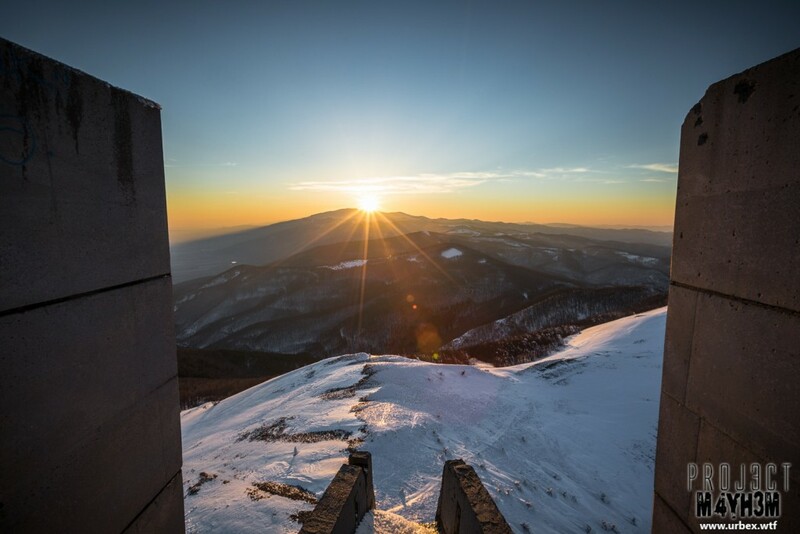 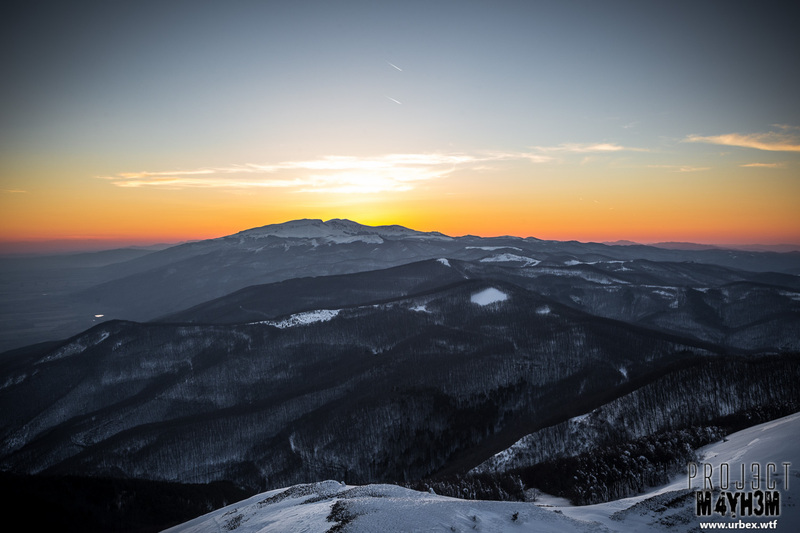 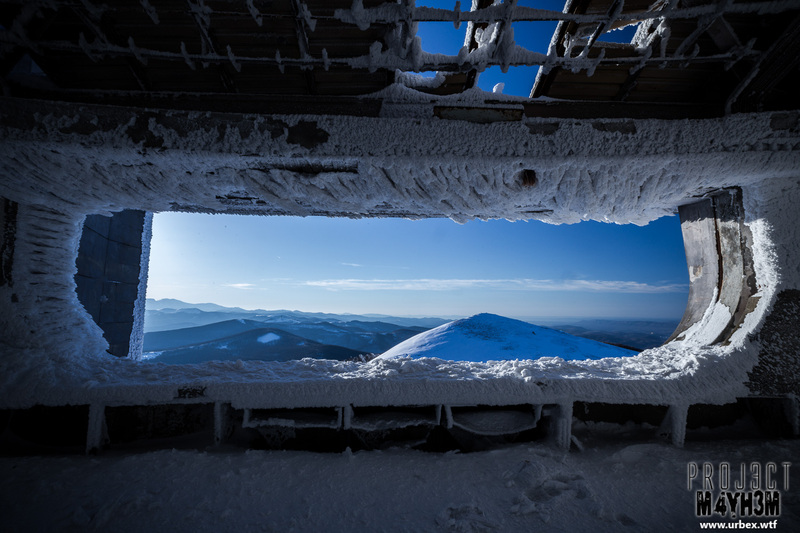 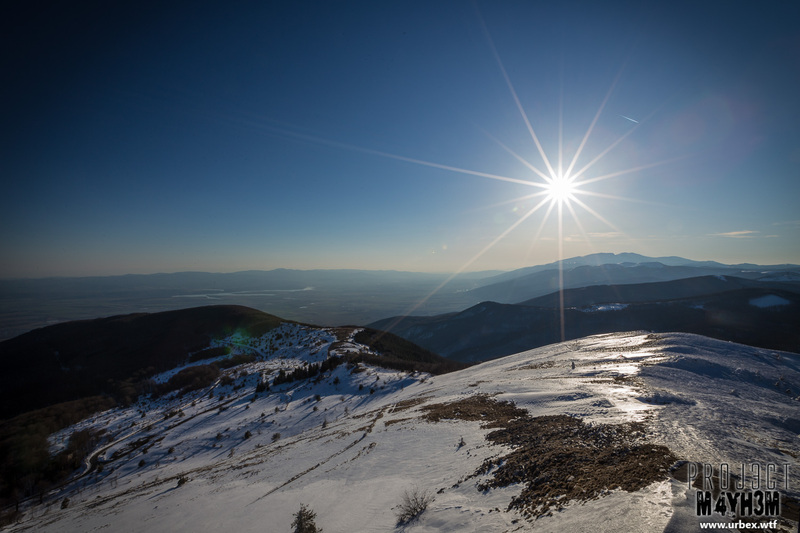 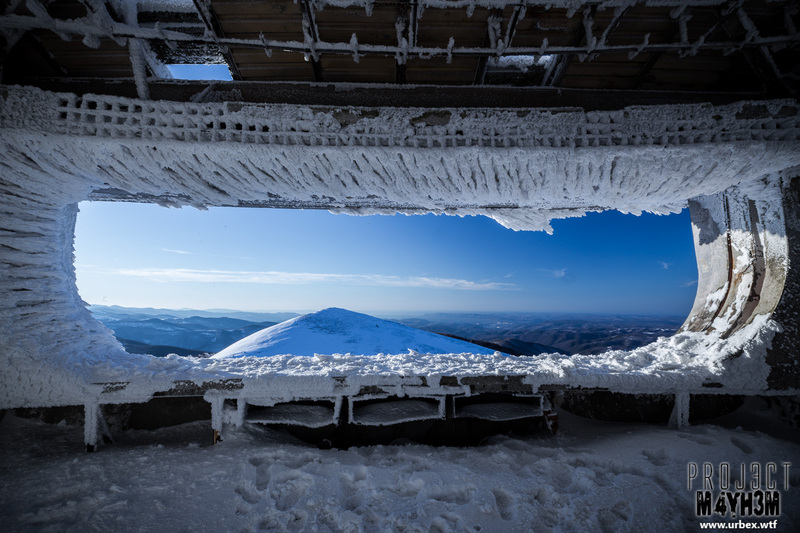 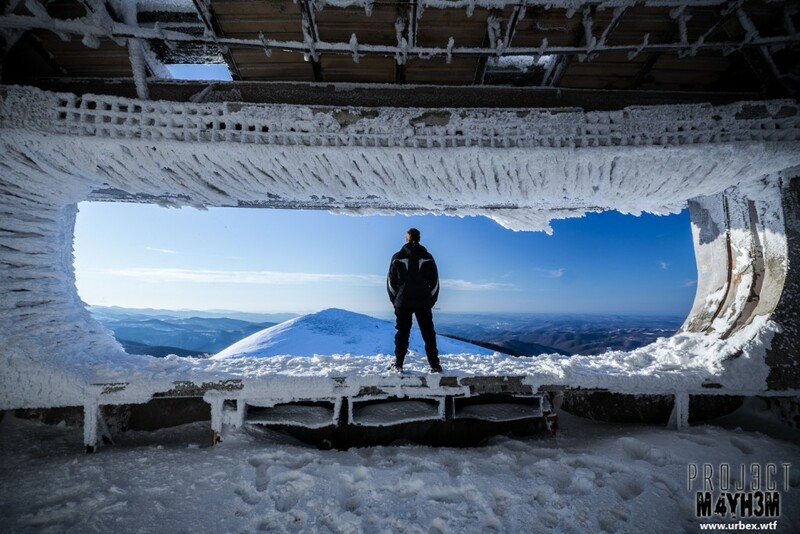 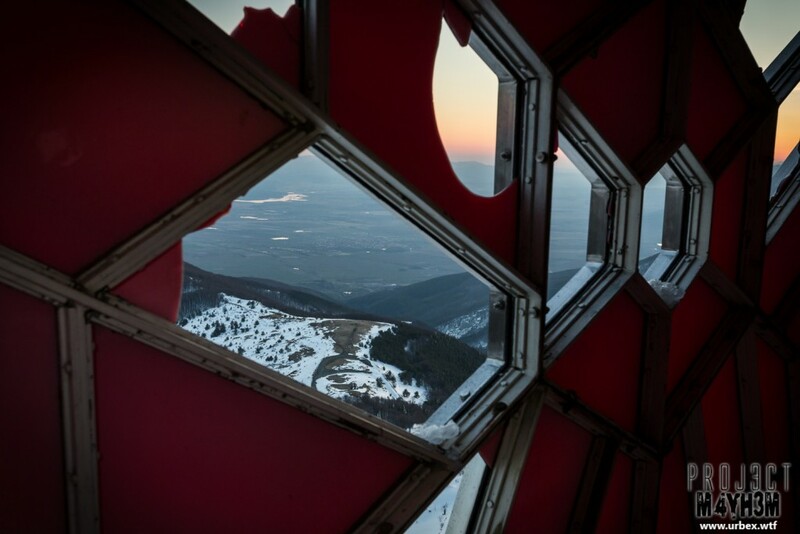 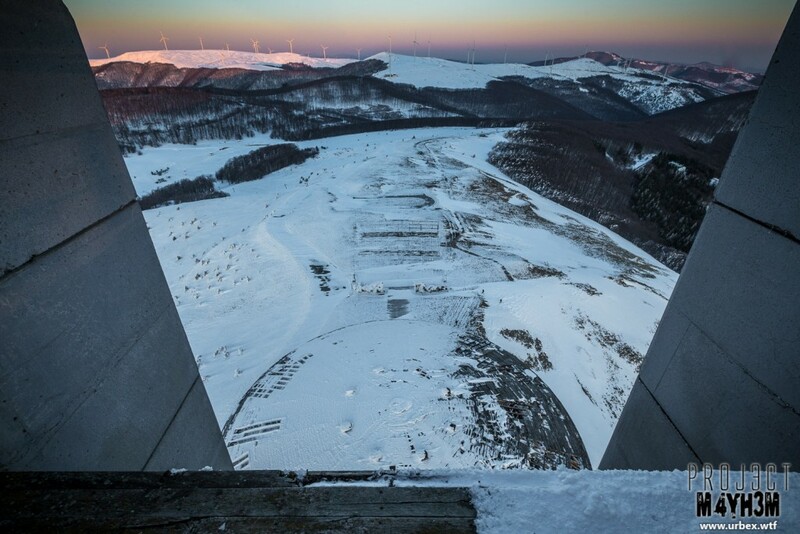 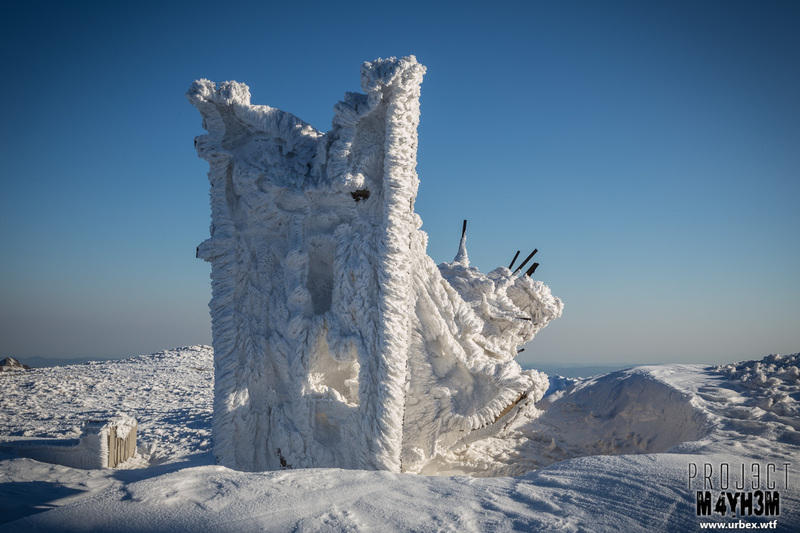 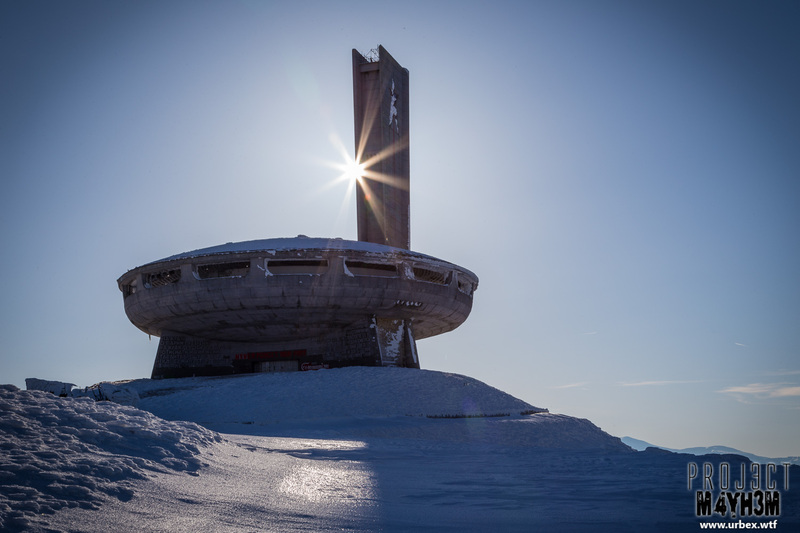 Given our travel dates in March it was a long shot and as we travelled across a significant portion of Bulgaria the weather was pretty warm and sunny… Fortunately as we approached the Buzludzha mountain we could see that the peak had a nice dusting of the white stuff! 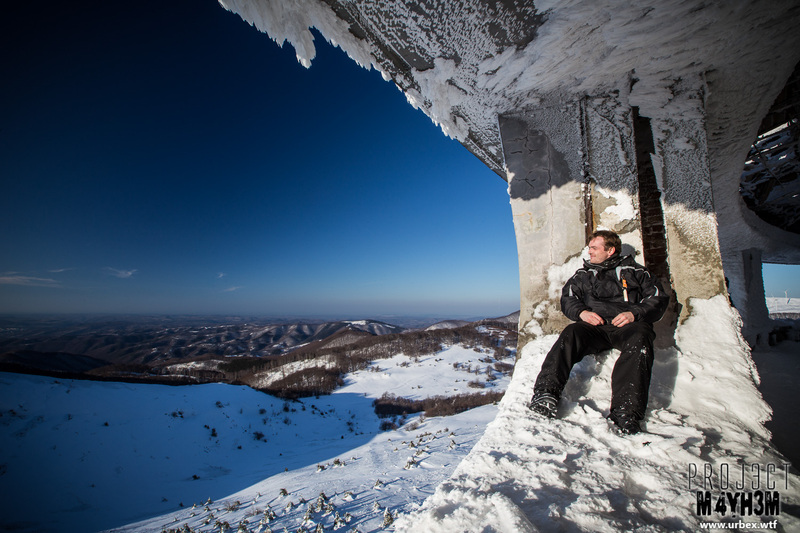 So much so that we couldn’t even get our cars up to the hotel and our base camp for the next few days! 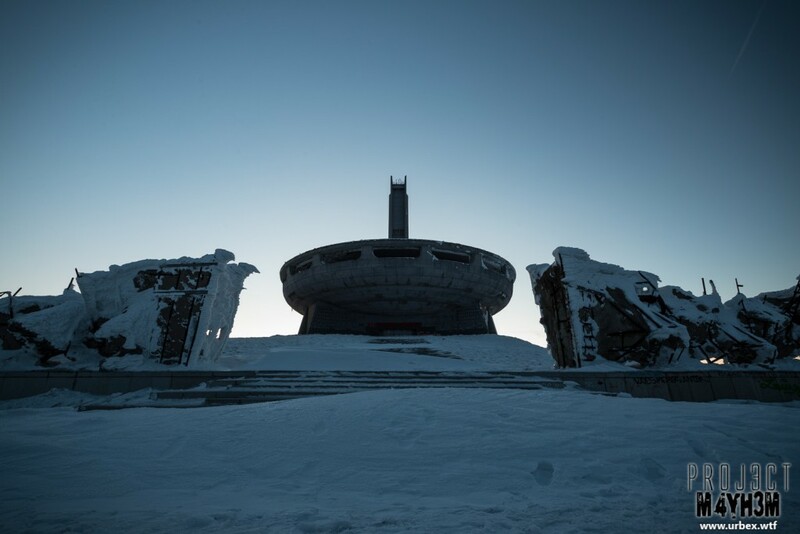 After ditching the cars and walking the rest of the way to the hotel we ditched our bags and headed straight up to the monument to catch what was left of the daylight. 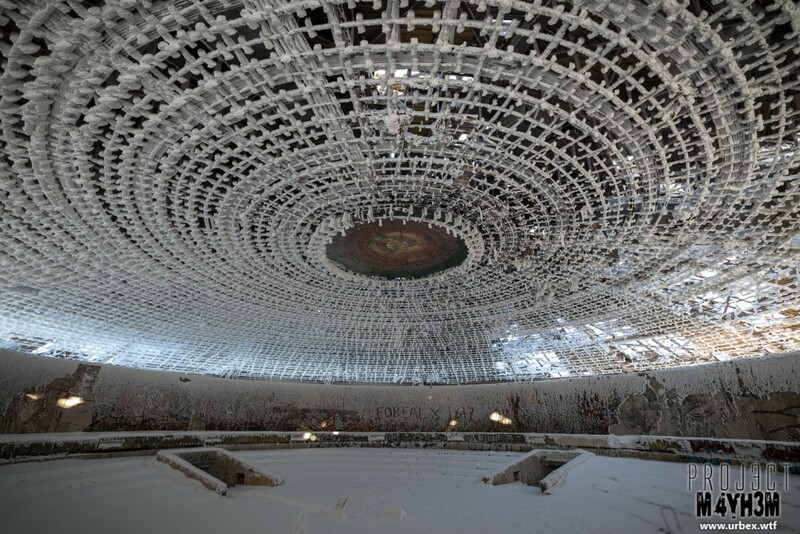 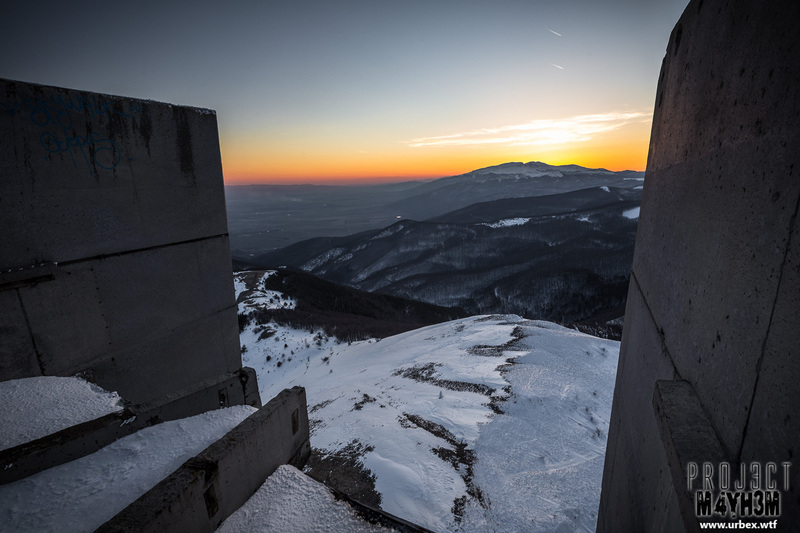 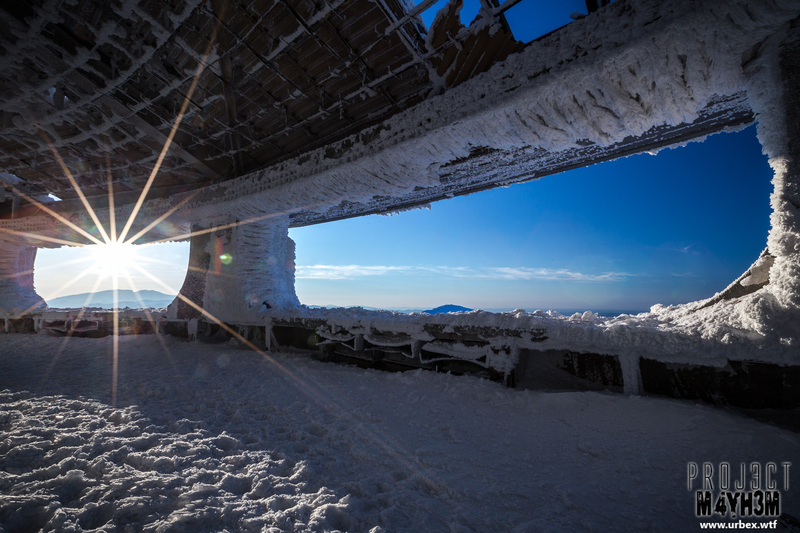 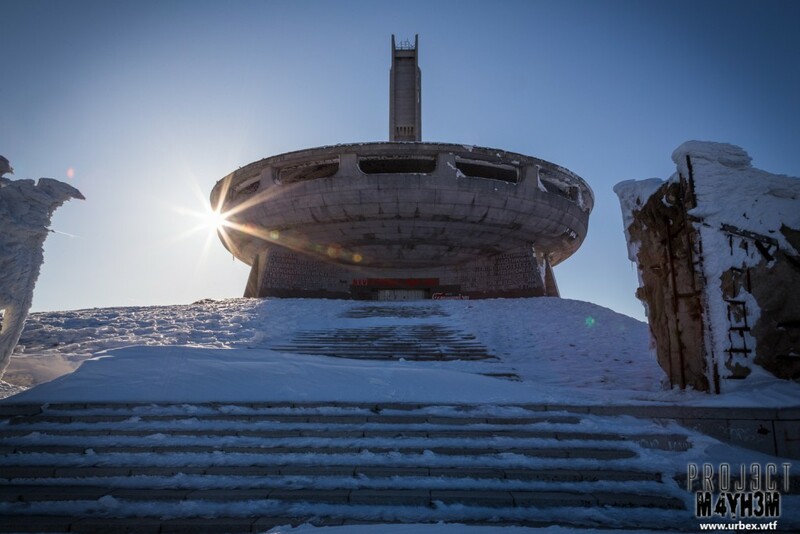 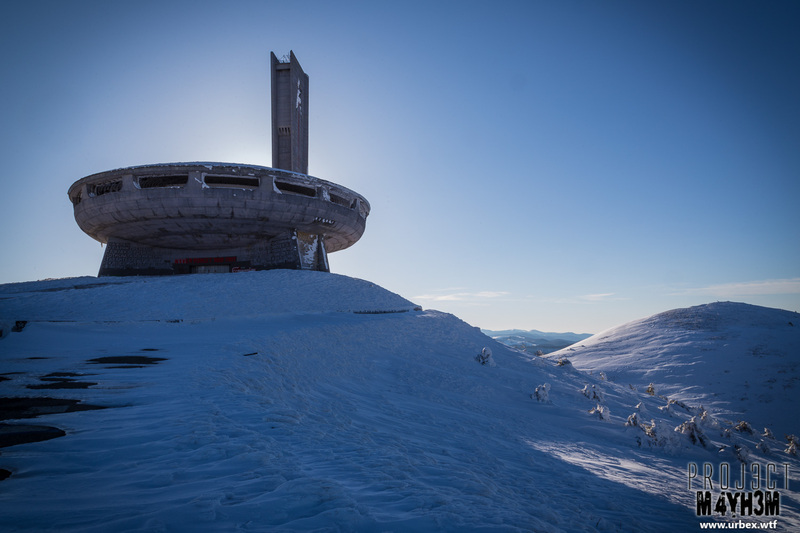 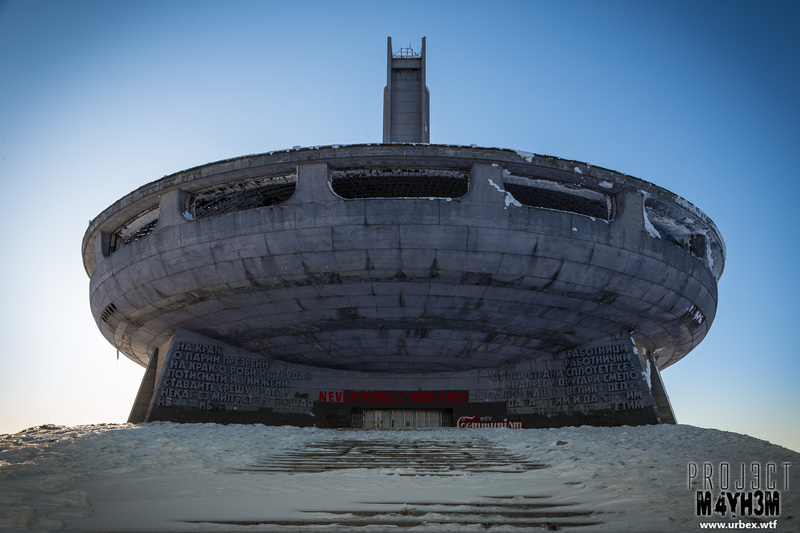 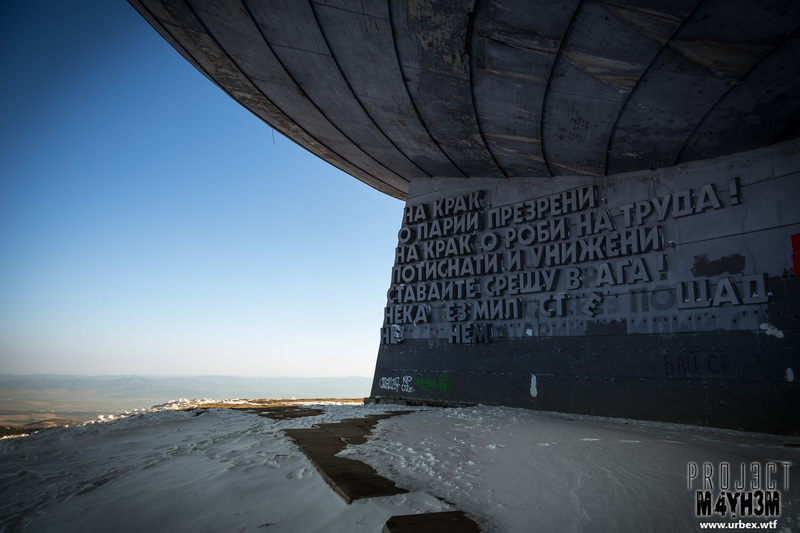 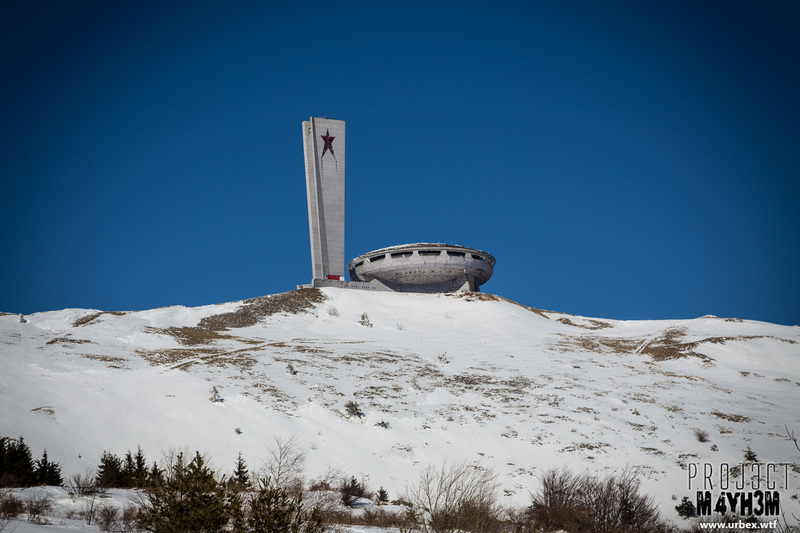 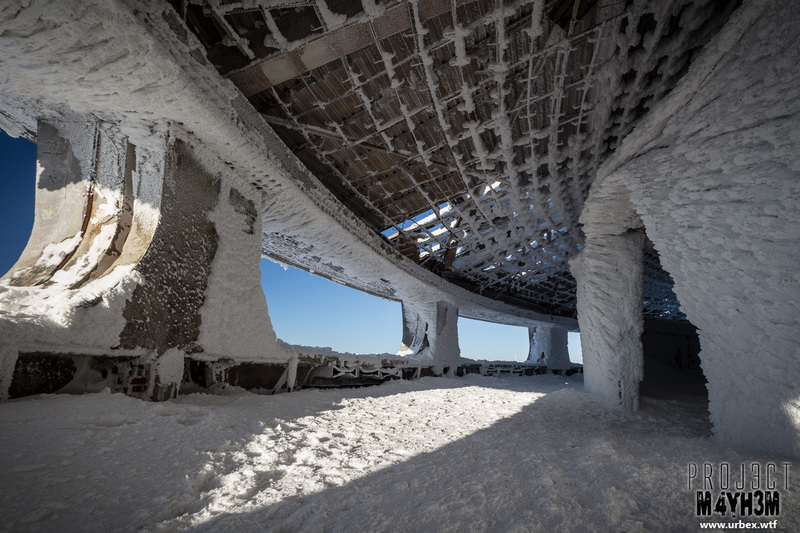 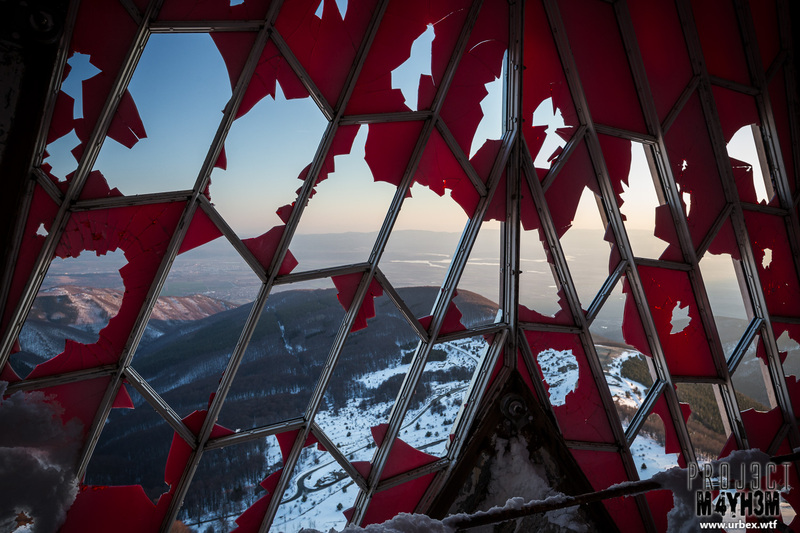 The Buzludzha, given its location right on the top of the mountain, is very visible for quite some distance as you approach but the sheer size of the structure doesn’t set in until you walk up to the main building. 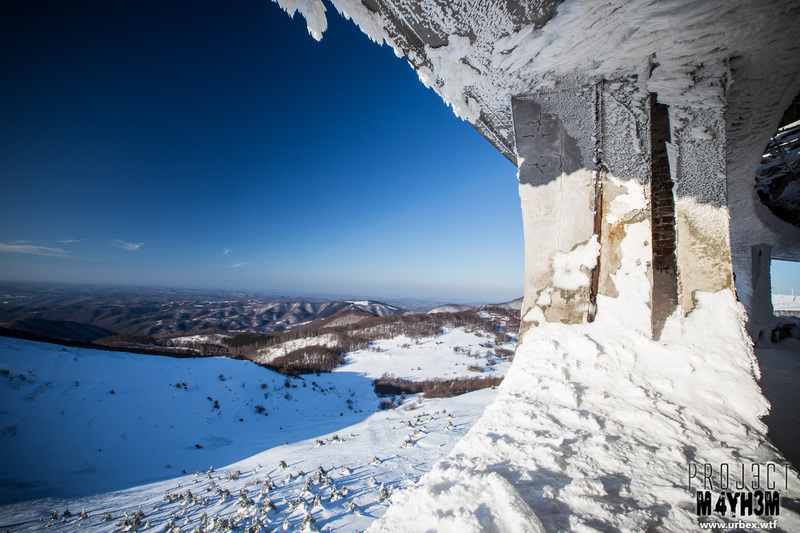 The tower seems much larger than it appears from further away and even more so when you climb the ladders to the top! 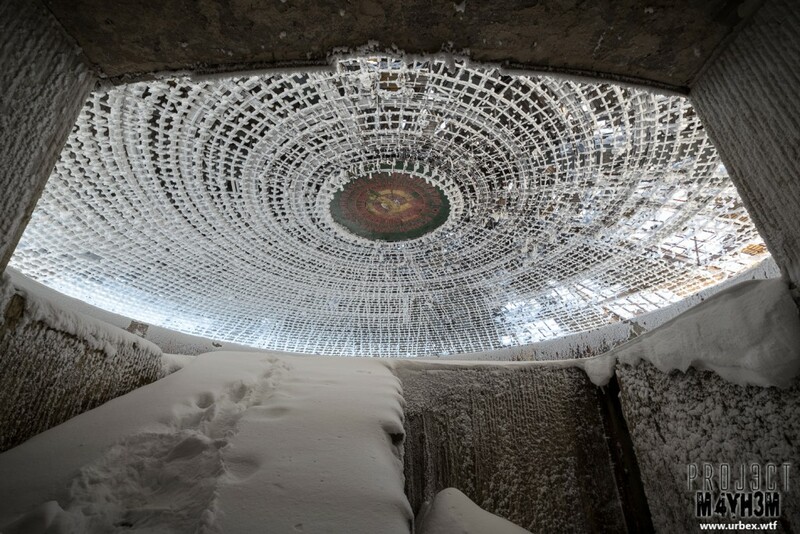 Once inside we made our way up the main set of stairs into the large circular auditorium which would have previously been filled with hundreds of communist party members. 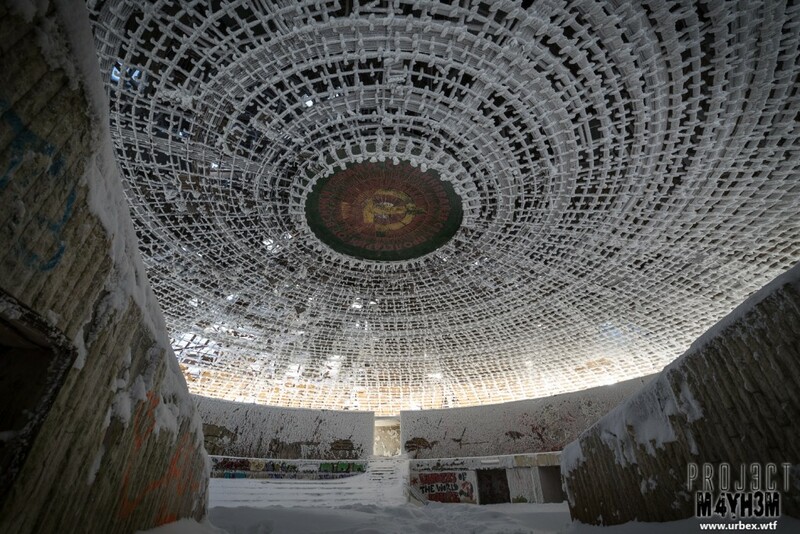 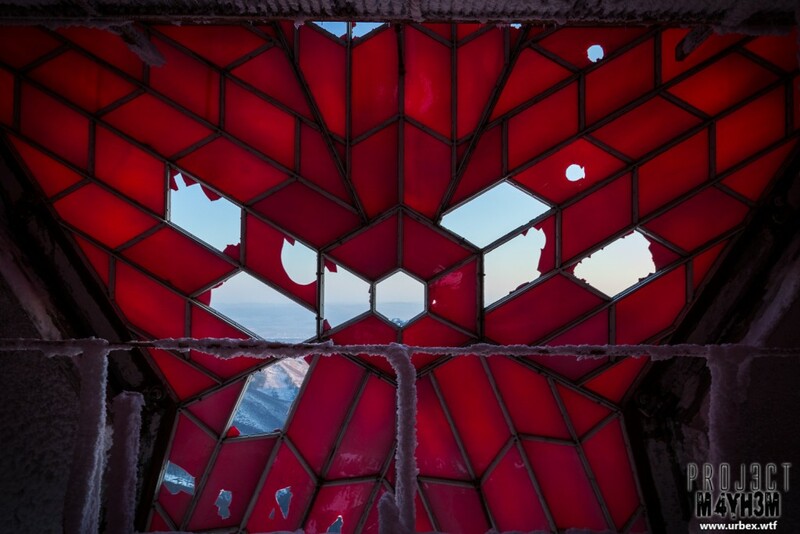 Undeniably the building is now in very poor condition with only the steel reinforced concrete structure remaining and a few original features from the mosaic pictures on the walls of the main room and the iconic emblem on the ceiling, still in the white cover of the snow this place was still very impressive. 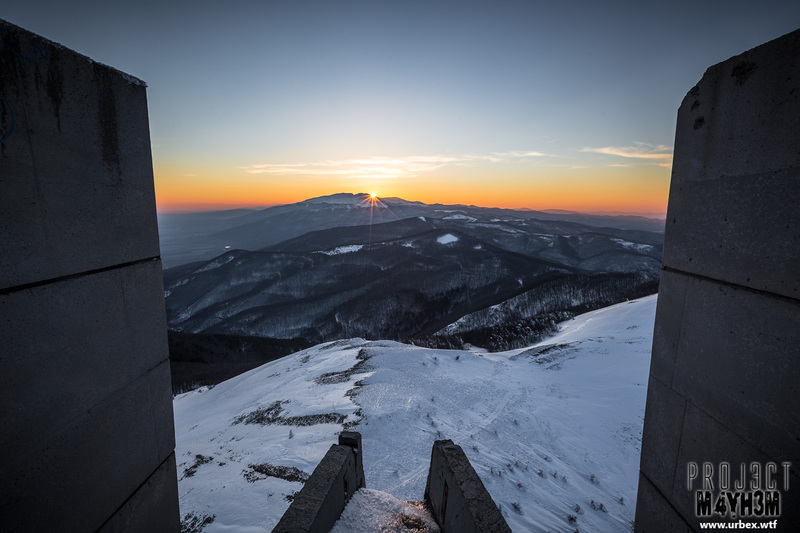 As it began to get dark I hunted around for access to the tower and made my way up to catch the sunset, I thought some of the other guys were following but I ended up up there alone for a good 45 minutes watching the sun go down over the surrounding mountain tops. Definitely one of those unforgettable moments in life! 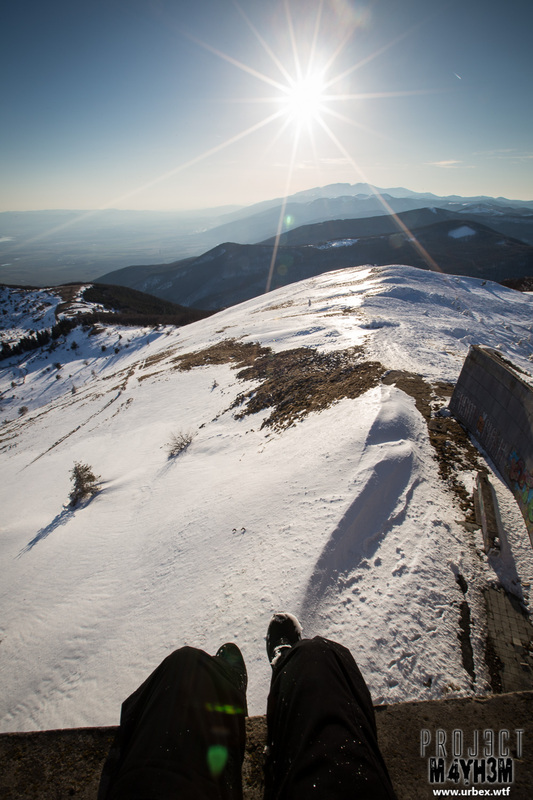 Shortly after it was back down, back to the hotel and time for cheap beer and local moonshine :D.